Look up yid in Wiktionary, the free dictionary. The word Yid (/ˈjiːd/; Yiddish: ייִד‎)[clarification needed] is a Jewish ethnonym of Yiddish origin. It is used as an autonym within the Ashkenazi Jewish community, and also used as slang by European football fans, anti-semites, and others. Its usage may be controversial in modern English language. It is not usually considered offensive when pronounced /ˈjiːd/ (rhyming with deed), the way Yiddish speakers say it, though some may deem the word offensive nonetheless. When pronounced /ˈjɪd/ (rhyming with did) by non-Jews, it is commonly intended as a pejorative term. It is used as a derogatory epithet by antisemites along with, and as an alternative to, the English word 'Jew'. The term Yid has its origins in the Middle High German word Jüde (the contemporary German word is Jude). From the German: Jude: 'Jew.' And 'Jude' is a truncated form of Yehuda, which was the name given to the Jewish Commonwealth in the period of the Second Temple. That name, in turn, was derived from the name of one of Jacob's sons, Yehuda (Judah, in English), whose descendants constituted one of the tribes of Israel and who settled in that portion of Canaan from Jerusalem south to Kadesh-Barnea (50 miles south of Beersheba) and from Jericho westwards to the Mediterranean. The earliest mention of the word Yid in print was in The Slang Dictionary published by John Camden Hotten in 1874. Hotten noted that "The Jews use these terms very frequently." 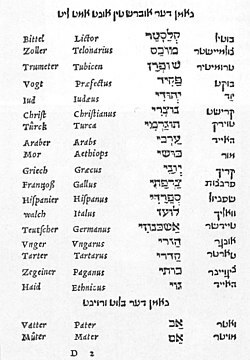 After World War II, most examples of the word Yid are found in the writing of Jewish authors. These occurrences are usually either attempts to accurately portray antisemitic speech, or as self-deprecating Jewish humor. In his 1968 bestseller The Joys of Yiddish, Leo Rosten offers a number of anecdotes from the "Borscht Belt" to illustrate such usage. In Yiddish, the word "Yid" Yiddish: ייד‎ is neutral or even complimentary, and in Ashkenazi Yiddish-speaking circles it is frequently used to mean simply "fellow," "chap," "buddy," "mate," etc., with no expressed emphasis on Jewishness (although this may be implied by the intra-Jewish context). Plural is יידן [jidn]. In Yiddish, a polite way to address a fellow Jew whose name one does not know is Reb Yid, meaning "Sir." The Yiddish words yidish or yiddisher (from Middle High German jüdisch) is an adjective derived from the noun Yid, and thus means "Jewish". Some Jewish and non-Jewish fans of Tottenham Hotspur F.C. adopted "Yid" (or "Yiddo") as a nickname and "Yiddo, Yiddo!" as a battle cry and often identify themselves as "Yid Army". While such usage remains controversial, for the majority of Tottenham supporters it is used with pride. Some Jewish Tottenham supporters use it with a political consciousness of the club as a bastion against racism and antisemitism. Fans of other clubs use the term as a pejorative because it is perceived that many Tottenham Hotspur fans are Jewish. This following started in the 1890s and 1900s when the club was the team of choice for "East-enders" – including large numbers of Jewish immigrants – who could easily get cheap buses and trams to Tottenham, heading north along the road later designated the A10. East-end Jews have mostly moved to the north and east London suburbs and Herts and Essex, but support for Tottenham Hotspur continues to run in families (a famous example is Alan Sugar). For visiting teams' supporters the Jewish connection continues to be bolstered by the large numbers of – easily identifiable – Haredi Orthodox Jews living in the South Tottenham and Stamford Hill areas; but in practice there is no evidence of Haredi Jews attending football matches. Nevertheless, it is not necessary to be Haredi to be Jewish, and Spurs still has a strong Jewish fanbase. ^ Leo Rosten: The Joys of Yiddish, 1968. Cited in Kim Pearson's Rhetoric of Race by Eric Wolarsky. The College of New Jersey. ^ "JPost | French-language news from Israel, the Middle East & the Jewish World". Fr.jpost.com. Retrieved 2013-11-29. This page was last edited on 31 March 2019, at 11:55 (UTC).